Fishing spoons and lures for trolling, casting, jigging with informative articles on fishing to improve your fishing enjoyment. We offer unique spoons in several sizes, colors and glow patterns. The genuine silver or nickel plating and glow in the dark Fire Fly ® technology will produce more fish in the cooler for you. All lures come with TWO hooks a VMC red treble and a nickle single hook. They are effective on all fresh and salt water game fish. Our fishing lures will catch Salmon, Lake, Rainbow, Brown Trout, Walleye, Pike, Striped Bass, Musky and all game fish. Special offer - BUY 4 OR MORE LURES AND WE WILL INCLUDE 1 FREE VULCAN SPOON. This was a very productive spoon during the 2017 season. 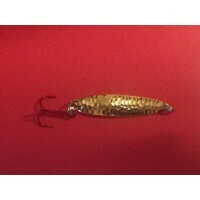 The Golden standard Diablo 1/2 ounce, 5/8 inch wide by 3 inch long fishing spoon has long ..
Salmon anglers worldwide have made these four spoons their first choice for Chinook and ot..
Lake Trout are a deep water fish caught at depths of over 100 feet. A mix of magnum glow s.. The Reaper Magnum Fish n Chip and the Reaper Magnum Peacock were used to catch the fish in this video. Blue Max Charters uses them on Lake Michigan off the shores of Milwaukee, WI.